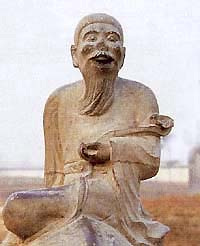 Lao Tse was the keeper of the archives in one of the many kingdoms that are now part of China. When he saw that the kingdom was in decline, he decided to leave. Upon reaching the border, the official in charge of the border pass stopped him and asked him to put his teachings into writing. Because of, or perhaps despite, being indubitably very wise, Lao Tse managed to do this in just a few weeks, producing a volume of a little over 5,000 Chinese characters. Handing the completed text to the guard, he famously mounted his bull, and disappeared off, heading westward. (Images of Lao Tse riding his bull are still popular in China to this day). Something amorphous and consummate existed before Heaven and Earth. Solitude! Vast! Standing alone, unaltering. Going everywhere, yet unthreatened. It can be considered the Mother of the World. I don't know its name, so I designate it, 'Tao'.